Caption this cartoon if you can! 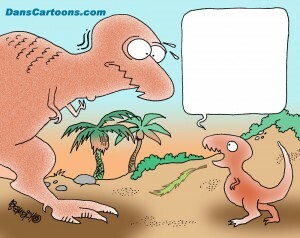 Welcome to the first “Caption This Cartoon” contest here on the ToonBlog. My previous post regarding gag writing prompted this contest. Anyone who thinks they have the ability to write a clever caption in the word balloon is invited to participate! Have you ever seen a cartoon published in some magazine and immediately thought to yourself that you can write a better caption? I have done this alot and actually have conjured up better ideas….or at least they were to me. Click the cartoon to enlarge it on your screen, so you can consider a good caption to put in the word balloon. Think about what elements that make up the cartoon could make for a funny caption. 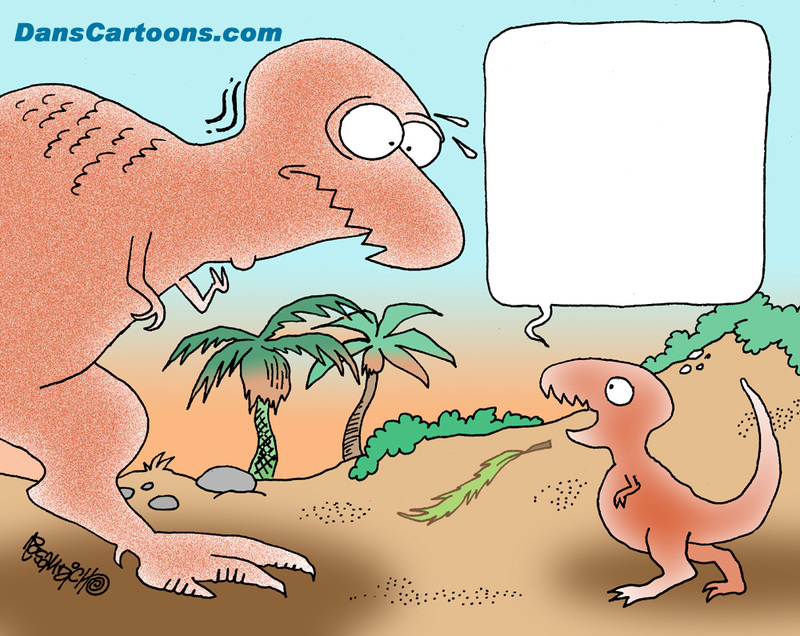 Some of my favorite cartoons to create are animal cartoons and the dinosaur genre has always been of great interest. There seems to be a never ending supply of tangents that a cartoonist or gag writer can go with, when it comes to these types of cartoons. Over the years I’ve incorporated cavemen into the cartoons, erupting volcanoes with the central characters talking about the potential dilemma, possibly an incoming asteroid that is about to annihilate all life, possibly the period in which they live (mesozoic etc. ), the body armor they possess and on and on. You may discover that writing comic ideas or cartoon gags is not as easy as you think. On the other hand, you may discover that humor is an untapped part of your creative ability. Many times I’ve picked up old copies of well known publications such as The New Yorker which is one of the world’s elite markets for cartoonists. They use so many in each weekly issue it is almost a “go to” source for me to personally look through and enjoy some of my favorite illustrators ranging from the likes of Tom Cheney, Sam Gross, Gahan Wilson and Mike Maslin to Joe Dator. Upon looking at certain cartoons (including many other types of magazines), I’ve noticed my “writer’s brain” kick into gear and have re-written many ideas this way, or have spun off my own type of cartoons. I recall seeing some birds on a bird feeder in a copy of New Yorker and I can’t quite recall the exact wording the birds used in that cartoon, however it prompted me to think of the water as being frozen over and them skating on the ice….using the feeder as an ice rink in the middle of winter. Just stumbling upon that one published cartoon panel, prompted me to envision my own favorite type of panel, a captionless gag cartoon! I’ve always appreciated the captionless type of single panel gag because it is so self explanatory and has a direct impact on the reader. 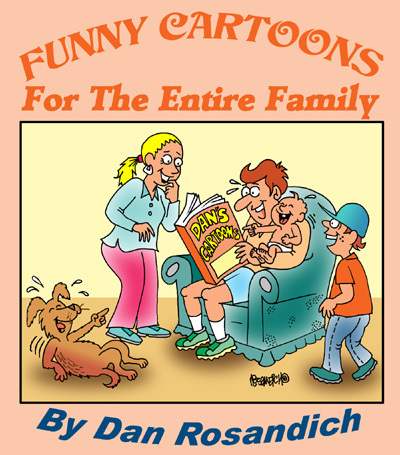 People who normally browse the cartoons throughout the humor pages of specific magazines or look at them in the back pages of certain publications will breeze over an image quickly and are usually digesting a magazine for certain articles or stories….the single panel gag cartoons are usually added as a quick “filler” or spot illustration to enlighten the reader, perhaps adding some extra added humorous flavor to their dull display ad laden pages. A captionless will pop out at these readers alot quicker in that they won’t have to read through a long caption or self explanatory gag line. When participating in this cartoon caption contest, be sure to use the “comment” form at the bottom of the page to post your caption. Be unique and be strange if you want to. Put on your thinking cap if you need to and take time to actually print out the cartoon on your printer and jot down ideas that come to mind so you can compare all of them together and choose the best one. They’ll be approved here for review and seen by anyone else who participates in the contest so others can compare the different ideas. Prize? I’m not really sure about this, since the contest is basically a fun related blog post feature and non commercial, but I’ll listen to any reasonable suggestions. As I’ve mentioned earlier, click the cartoon to show it larger on your screen and print it out if you have a printer connected to your computer. It may help to have a tangible hard copy the comic in hand, to hold and read since this process has helped me in the past. Now get busy, and if you have other personal comments I can be reached via my email contact form at the top of this page! addendum: other ways that help to generate new single panel cartoon ideas are to gather all of the day’s comics pages and scour the comic strips….even a specific panel in a certain comic strip may possess that one single piece of material that germinates a new cartoon idea. Looking through old cartoon anthologies is another great resource for finding additional gag ideas for your cartoons. In the future I hope to present more of these cartoon caption contests and I’ll gauge what kind of response this gets as to whether or not similar contests will be worth having in future ToonBlogs. Want to know how a typical day for a cartoonist for the New Yorker magazine goes and how he generates some of his cartoon gag ideas? Visit my fellow cartooning amigo here!